Heat oven to 350°F (325°F for dark or nonstick pans). Place mini paper baking cup in each of 24 mini muffin cups. Make cake mix as directed on box, using water, oil and eggs. Stir 1/2 teaspoon of the mint extract and 1/2 cup chocolate chips into batter. Fill muffin cups two-thirds full. (Cover and refrigerate remaining batter until ready to bake; cool pan 15 minutes before reusing.) Bake 15 minutes or until toothpick inserted in center comes out clean. Cool 5 minutes; remove cupcakes from pans to cooling racks. Cool completely. Repeat with remaining batter to make an additional 48 mini cupcakes. In large bowl, beat butter, powdered sugar, food color and remaining 1/2 teaspoon mint extract with electric mixer on low speed. Stir in 1 tablespoon milk. Gradually beat in just enough remaining milk, 1 teaspoon at a time, to make frosting smooth and spreadable. Spread frosting on cupcakes or pipe with #22 star tip. Sprinkle miniature chocolate chips over frosting. 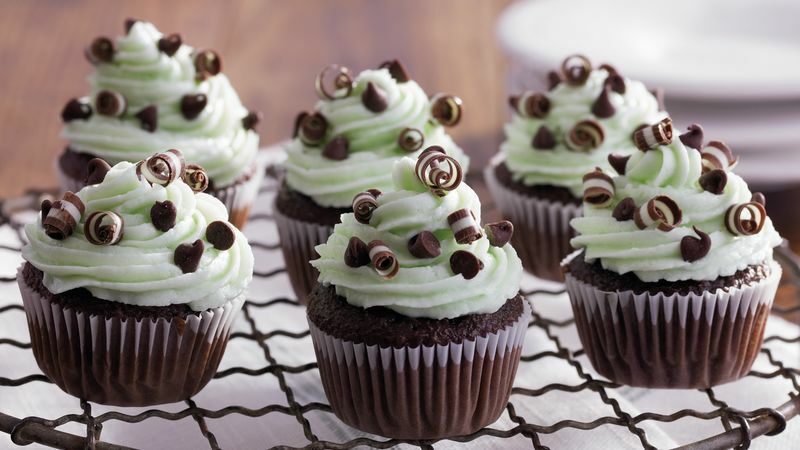 Use vegetable peeler to make chocolate candy shavings; sprinkle on cupcakes.